The Oklahoma City University School of Visual Arts will host a Spring Equinox exhibition, coinciding with the annual campus powwow from 7 p.m. to 9 p.m. March 31 in the Nona Jean Hulsey Gallery at the Norick Art Center at N.W 26th and Blackwelder Avenue. The exhibition will highlight Native American art-making in Oklahoma and feature work from Molly Murphy Adams, Joanna Blackburn, Brent Greenwood, Benjamin Harjo Jr., Timothy Tate Nevaquaya, Harvey Pratt, Bert Seabourn and DG Smalling. “The Vernal Equinox has been reverently observed by Native cultures since ancient times when tribes relied on the position of the sun to inform the annual calendar,” said Russ Tallchief, director of student engagement, inclusion and multicultural programs at OKCU. “The Vernal Equinox marks the awakening of the sleepy winter and birth of new life in the natural world. Our Oklahoma City University Native art exhibition honors this rite of passage through our celebration of Native artists whose work intrinsically symbolizes the birth of new life as they continuously create new artistic and cultural expressions through their work,” he said. The event is free to the public and will feature live music and painting demonstrations. 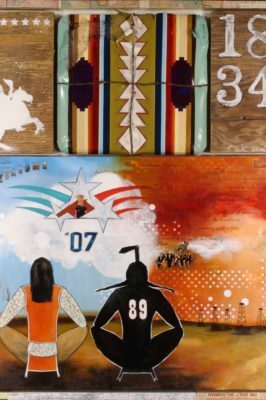 “The eight featured artists encompass a wide range of styles and techniques, reflecting the diversity and richness of tribal cultures in our state,” said Holly Moye, director of the OKCU School of Visual Arts. For more information contact Holly Moye at hmmoye@okcu.edu or 405-208-5569.